I’ve been slowly waiting for all the parts to arrive to start building guitar #2, which still has no name, and everything is now here. I’m not going to write about every little step but I will take some progress photos. The ferrules have already been installed but unlike on guitar #1, the Frankencaster, I did not heat them up and then press them in. I tried a more conventional approach. I took a piece of 1/4 inch dowel, cut it to 2 inches, and sanded it, reducing the circumference so that it fit into the ferrule hole. Then I took some #220 grit sand paper and lightly sanded the inside of the ferrule holes. Then I pushed the ferrule into the hole and gently tapped it in with a rubber mallet. Presto and ipso fatso! Worked well. What is next? Wiring. I want to wire the pickups and controls. 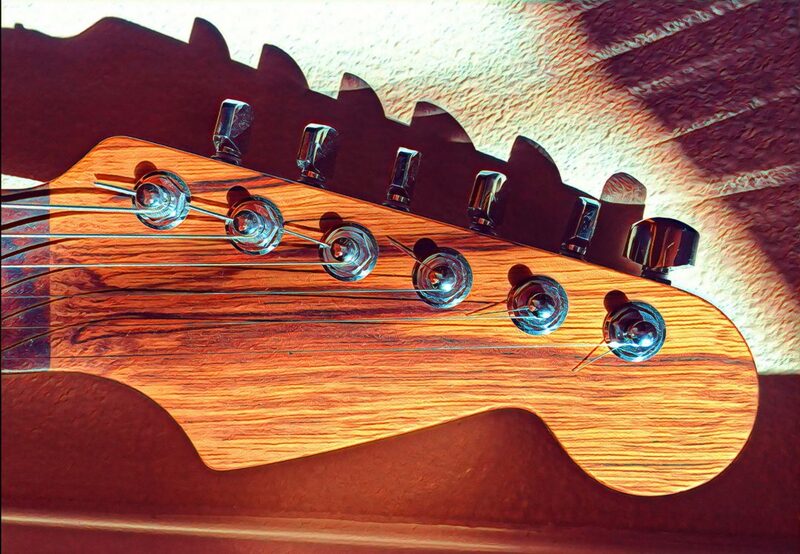 But first, check out the most excellent grain on this neck – this maple neck has an ebony fretboard.